This article represents the first of a three-part series discussing the potential for embezzlement within an organization by its accountant/bookkeeper/office manager (ABOM). ABOM is considered one of the most trusted employees within an organization, making them prime candidates to commit internal fraud. On a daily basis, an ABOM may be dealing with incoming cash receipts, cash disbursements, and processing payroll, including employee benefits programs and expense report reimbursements. This article, specifically, will address the ABOM’s ability to embezzle funds related to cash receipts using skimming and larceny techniques. It is common for an organization to receive payments from customers/clients via check, credit card, or in some instances, cash. In an ideal world, this process of receiving payments would be separated into multiple levels of job duties, including, at a minimum, somebody who receives the mail, an ABOM who records the transaction, and a third employee who makes the deposit. This does not eliminate the risk of fraud associated with cash receipts, but it is the first step to stopping embezzlement. Unfortunately, this is often times not the case within organizations leading to an ABOM with too much authority over incoming payments, which allows for a prime opportunity to steal. Skimming is the first technique that can be used by an ABOM to embezzle funds from an organization. Skimming is considered an off-books fraud, or in other words, the money is removed before it is recorded by the ABOM into the accounting system. This means that in order for the fraudster to mask their theft, it is necessary to adjust the customer/client account accordingly so that their future billings are not shown as overdue as a customer/client complaint should uncover a fraudulent skimming scheme very quickly. A customer/client who is credited with the wrong amount is almost guaranteed to complain and uncover any discrepancy in their billings whether it is due to error or fraud. Therefore, when a fraudster is in control of both receiving and posting, or there is collusion amongst employees, there will be a need to mask the client account to ensure their account is not overdue. In order to accomplish this, the ABOM will have to post the skimmed payment to a customer account, which typically requires an entry to the cash account which will cause an imbalance when compared to the actual bank account. There are multiple ways for an ABOM with too much authority to cover this up. A lapping technique could be used by an ABOM to cover up the theft of a check. This is when, in order to cover the stolen check from a client, the ABOM will use another client payment and apply their funds towards the missing payment. This can become a complex scheme because now the second client account will be understated, requiring a third payment to be applied to the wrong account. It is a never-ending cycle as there will never be enough cash to cover what the fraudster stole. By examining the difference in the date of the client payments and the date it was posted, a lapping scheme can be uncovered. It is also possible that somebody embezzling funds by stealing checks may attempt to doctor future invoices or billing statements so that the client is never aware their account is out of balance, and the fraudster never actually posts the payment. This is unlikely to succeed, considering, somewhere down the line somebody in charge of the outstanding accounts will recognize the discrepancy and go looking for payment from the customer/client, which will inevitably uncover the scheme. This entry has now created a receivable that is overstated and due from a fake company that will never make a payment since they do not exist. The other approach is to use an existing customer/client account with a very large outstanding balance that is overdue and has aged to the point of being written off. By doing this, it may be possible to conceal a small amount. This entry is especially effective if the past due client is paying minimal or no attention to incoming statements or invoices and has no intention of paying the outstanding balance. To go even one step further, rather than using a fake client account or an aging delinquent account, some ABOMs have authority to write off a customer balance themselves. In other words, when an ABOM collects the mail and converts a check to be used for their personal gain, they can then post the amount paid into a bad debt expense account and write it off while never being posted to the client account at all. A person independent of the cashier or accounts receivable functions handles customer complaints. Larceny is when an employee steals cash, or check in the case of an organization, after it is recorded into the accounting system. This fraud is more difficult to conceal as the ABOM would already have recorded the item but would steal the check ready to be deposited. The most common type of larceny scheme involves an employee who works the cash register and removes cash by using another employee’s access code and concealing the fraud via false refunds or voids. In the case of an organization, as previously discussed, this is not how business is done. Therefore, in order for an ABOM to conceal a larceny scheme it would truly require no separation of duties or a significant collusion scheme. When a check payment is received and the ABOM collects the mail or is given the mail from somebody else, the scheme would be considered larceny if the ABOM then proceeded to enter the payment as usual to the customer/client account. Then when preparing the deposit they would steal the check. This would cause an issue because the cash account on the books would be out of balance with the bank account forcing the ABOM to make an entry to show that nothing was paid on the client account, such as a false discount. The other larceny scheme that could be perpetrated by an ABOM of an organization would be stealing client checks after the deposit has been prepared. In other words, it is typical that once the payments are collected from the mail and then posted to the appropriate account by the ABOM, there should be an employee who prepares the deposit slip, keeps a copy for themselves and then a different person who takes the deposit to the bank to be processed. If this process is correctly followed, the firm should then reconcile the deposit slip that was verified by the bank and the original deposit slip prepared at the office. If the organization follows this process of using separate employees to prepare the deposit, take the deposit to the bank, and reconcile the deposit, it will be difficult for an ABOM to conceal the theft. If a firm follows those guidelines, the only way to conceal the discrepancy in deposit slips would be to alter the deposit slip after it is processed by the bank. It is much easier for an ABOM to steal a check from the deposit if a company does not reconcile the original deposit slip to the deposit slip handled by the bank. In this case, there would be no need to alter the original deposit slip. If the ABOM is the only person who handles a deposit after entering it into the accounting system, they can simply prepare an incorrect deposit slip and deposit the amount to the bank without the stolen check. In either of these situations, it is still necessary for a fraudster to conceal the theft as the cash account on the books will not match the cash account at the bank. The first technique, which was previously discussed, is lapping the deposits with the next day’s deposits. As we know, this technique will only work as long as there are consistent cash receipts incoming each day. Fortunately, this may not be the case for an organization collecting large checks from few clients rather than a high volume of small payments. Another common method for hiding the larceny scheme would be to record the deposits that were stolen and never deposited as deposits in transit. This would make it seem like the amount that was stolen is correctly entered on the books but the bank has simply not cleared the check yet, which would explain the discrepancy in the account balances. Require employees to take vacations and have somebody fill in their duties. As the reader can see, the overarching theme to this article is the fact that it is necessary to separate the duties related to cash receipts. It is very common in an organization, and especially so in a small or medium size one, to have a very small staff working in the accounting and bookkeeping department. This makes an organization very susceptible to fraud at the bookkeeping level. 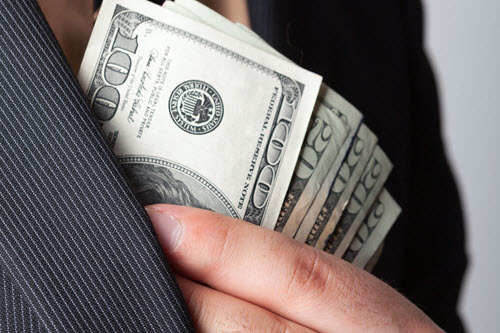 By adding more layers to the duties performed when a check is received, posted, and deposited is the key to avoiding a potentially devastating embezzlement by an ABOM. The next article in this series will be a continuation of ABOM embezzlement but will be related to the cash disbursement side of an organization.